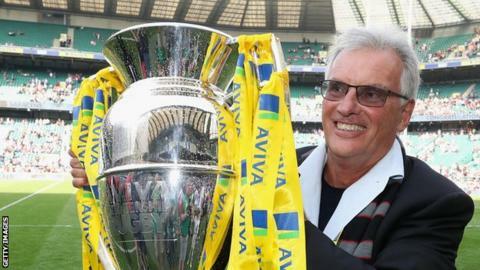 Saracens owner Nigel Wray says the club are "open and transparent" with the Premiership's salary cap regulations. A Daily Mail investigation last week revealed a number of business dealings between Wray and some of the Premiership champions' biggest earners. The club responded at the time to say they "readily comply" with the league's regulations regarding salaries. "If any of our players have a sound commercial idea, I am interested and I may invest," said Wray. In a statement on Monday, he continued: "I recognise that in some quarters, these co-investments are perceived as part of the Premiership salary regulations. They are not. Investment is not salary. Investments go up and down. It's an opportunity and a risk. "It might be immodest to say this but between the board and some hugely generous supporters our players have access to some of the best investment advice available anywhere in the country and we are all happy to share this for everyone's benefit. "The club is open and transparent with the salary cap manager and we proactively disclose co-investments when they occur, even though we are under no obligation to do so." Captain Brad Barritt, winger Chris Wyles and former skipper Al Hargreaves are among a number of players to have business arrangements concerning the club or Wray. Premiership Rugby said on 4 March that they would investigate to see if Saracens are in breach of regulations. Saracens say they are able to spend above the £7m cap because of the high proportion - almost 60% - of home-grown players in their squad. Billy Vunipola is due to return to Saracens after England's final Six Nations match against Scotland on Saturday, and said he is "as excited as anyone else to go back to the club". The number eight told BBC Sport: "We've got good boys at the club. "We don't have many people outside our little bubble that like us as much as we like each other, we just have to stick together and stay strong. "I haven't seen the article, but I'm proud to be a Saracens player and proud to represent what we stand for." Meanwhile, work on a new West Stand at Allianz Park will begin in the off season after the reigning Premiership champions were granted full planning permission.